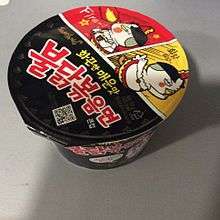 Buldak Bokkeum Myun Samyang Food Produced in South Korea since 2012, and also sold overseas, Buldak Bokkeum Myun is known for being one of the most spiciest ramyeon brands in Korea. Indomie Indofood Brand by Indofood in Indonesia. 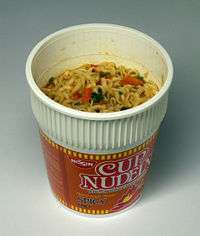 Koka Instant Noodles Tat Hui Foods Manufactured in Indonesia, sold domestically and internationally. Mr Lee's Noodles Mr Lee's Noodles Company Ltd Brand in United Kingdom using freeze-dried ingredients. Certified low in sugar by Sugarwise and gluten free by Coeliac UK. 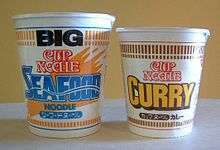 Sold domestically and internationally online and from 2017 through digital vending machines (Noodle Kiosks). 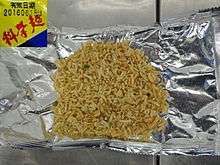 Science Noodles are usually eaten without cooking the noodles. 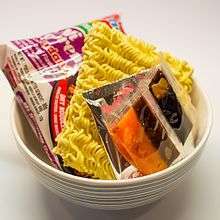 Instead, the bag is crushed with the ramen noodles inside, and the included seasoning is added. ↑ Kim, Kyung-moo (20 December 2014). "South Korea found the most ramen-eating country". Hankyoreh. Retrieved 2015-09-22. ↑ Ko, Dong-hwan (3 March 2014). "Korean ramen war now 'broth-less'". Korea Times. Retrieved 2015-09-22. ↑ Shin, Jeana (16 January 2015). "Samgyang Food's "Fire Noodles" Become Popular Overseas". Business Korea. Retrieved 2015-09-22. 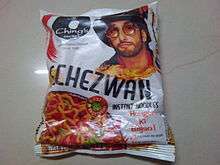 ↑ "Samgyang Food's "Fire Noodles" Become Popular Overseas". Retrieved 13 July 2016. ↑ "Super Spicy Korean Noodles (Buldak Bokkeum)". Retrieved 13 July 2016. ↑ "Bag". Retrieved 19 July 2016. ↑ "Container". Retrieved 19 July 2016. 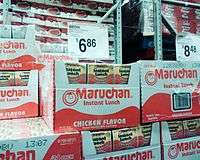 ↑ "Meet Momofuku Ando, inventor of Ramen Noodles". ↑ "makanai, demae, shidashi | Japanese-English dictionary". EUdict. Retrieved 2012-11-17. ↑ "Japan's Demae Ramen Rocks in Hong Kong". japanstyle.info. Feb 6, 2010. Retrieved 28 October 2012. ↑ Park, Si-soo. "Paldo expanding business in Russia, US". Korea Times. Retrieved 2015-09-22. ↑ Jeong, Seong-jin (23 April 2015). "팔도 도시락 컵라면 40억개 팔렸다". Chosun Biz. Retrieved 2015-09-22. ↑ Lienesch, Hans. "Tag Archives: Anderson Watts". The Ramen Rater. Retrieved 2016-10-11. ↑ "Products » Mr Noodles 85g". Beltek (Huizhou) Foods Co., Ltd. Retrieved 2016-10-11. 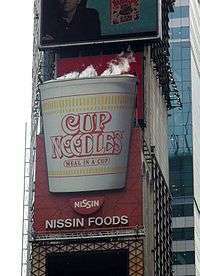 ↑ "Golden Wonder launches The Nation's Noodle". Talking Retail. 29 July 2009. Retrieved 9 September 2009. ↑ Kemp, Ed (24 July 2009). "Golden Wonder to take on Pot Noodle with 'The Nation's Noodle'". Marketing. Retrieved 9 September 2009. ↑ "45억 개… 맛으로 쌓은 30년 사랑". DongA Ilbo. 3 May 2012. Retrieved 2015-09-22. ↑ Won, Sungyeal (1 January 2015). "2014년 국내 라면시장 규모 1조 9700억원대". DongA Ilbo. Retrieved 2015-11-28. ↑ Ko, Dong-hwan (3 March 2014). "Korean ramen war now 'broth-less'". Korea Times. Retrieved 2015-11-28. ↑ "브랜드관 | 농심". 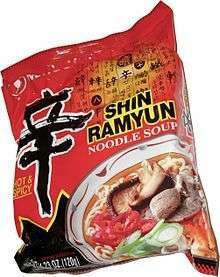 brand.nongshim.com. Retrieved 2016-06-08. ↑ "Smith & Jones - About Us". Smith-n-jones.com. Retrieved 11 December 2014.